On Tuesday morning, word around the NFL was that the Bears were basically formalities away from locking up Vincent Jackson and Mario Williams. By 5 p.m., the Bears had acquired Brandon Marshall, but the Bills were now going to host Robert Meachem and Mario Williams and sign them both before their fans woke up the following morning. As the clock struck midnight on the East Coast, Meachem was on the Chargers, Williams was a free man, and we vowed to stop listening to the rumor mill. And then on Wednesday at 12:05 am on the East Coast, we started refreshing Twitter every five seconds while jonesing for our fix. We’re only human. By the end of a busy first day of free agency, the league had raided the wide receiver and cornerback aisles and left them barren, with 10 notable signings between the two positions alone. About half of those moves made a lick of sense, as logic took a backseat to getting (or spending) cash now. It is our duty to cover both the insightful and the incoherent, and so we start our look at Day 1 of free agency in Washington, where the Redskins defied the odds to pull off their best Redskins impersonation. Part 1: Which teams can’t spend? Part 2: Which teams should stay out of free agency? Part 3: Which teams should spend a little? Part 4: Which teams should go all out? And so the Redskins found it in their hearts to give Pierre Garcon a five-year, $42.5 million contract with $21.5 million in guaranteed money. This is the same Pierre Garcon who has caught just over 53 percent of the passes thrown to him over the past three seasons despite having Peyton Manning at quarterback for two of those three years. The other Colts wide receivers caught just under 64 percent of the passes thrown to them over that time frame. And while a low catch rate is fine if you’re a deep threat or a demon after the catch, Garcon’s averaged 13.6 yards per catch over that span, which is almost exactly league average. Jabar Gaffney has averaged more yards per catch over the past three years than Pierre Garcon. Is he a downfield threat? Garcon might be the better player, but it’s not a clear case. At the very least, the difference between the two of them over the next two seasons certainly isn’t $21.5 million in guaranteed cash. As bad signings go, this isn’t bringing in Albert Haynesworth, since Haynesworth was at least at the top of his game in the two seasons before the Redskins paid too much for him. This is more like the signings of DeAngelo Hall or Brandon Lloyd, when the Redskins acquired (or retained) a B-list player by giving him A-list money. You can make the case that Washington needed to upgrade at wide receiver and give RG3 options, but you don’t accomplish that by throwing $21.5 million at league-average receivers. On the other hand, the Redskins made a perfectly rational, reasonable decision to buy low on Josh Morgan, who broke his leg after five games and missed most of San Francisco’s 2011 season. Morgan’s statistics aren’t all that impressive, and he’s not regarded as a burner, but he’s spent the past three years playing with Alex Smith in a conservative offense. It’s also worth noting that he’s averaged 13.0 yards per catch over those three seasons, virtually identical to Garcon’s figure. The Redskins only paid $7.5 million in guaranteed money for Morgan on a five-year, $12 million contract that will void after two years (for cap purposes, the Skins will spread the signing bonus hit over five years, but it’s essentially a two-year deal). Washington may find that Morgan’s actually the better player of the two. We were right to assume that there were two oversize wideouts on the market who would move fast during free agency, but we had the wrong receivers. After the Saints locked up Marques Colston early Tuesday morning, the Bears abandoned their chase of Vincent Jackson and shockingly acquired Brandon Marshall from the Dolphins for a pair of third-round picks. The Marshall trade didn’t obviously stink the way that the Santonio Holmes trade did — when the Jets acquired a Pro Bowl-caliber receiver for a fifth-rounder — but the sudden availability and acquisition of Marshall suggested that there was more to the move than meets the eye. It was no surprise hours later, then, when Adam Schefter reported that Marshall was being investigated by the league for yet another off-field incident. It later came to light that Marshall had allegedly “slugged” a woman in the face at a New York City club on Sunday, a move that might have inspired Miami’s desire to give up on Marshall. The only logical perspective from which this makes sense for the Dolphins is the disciplinarian angle, where a new head coach simply wanted to move on from a frustrating player. That makes for wonderful quotes, but Marshall was the team’s best offensive weapon by a wide margin, and there’s nobody left on the market to replace him. They gave up two second-round picks for Marshall and then paid him $19 million for two years of above-average production before shipping him away for two third-round picks. Obviously, what Marshall offers on the field is worth more than two third-round picks. Over the past five years, only four players have more receiving yards than Marshall, and his three 100-catch seasons all came in Denver with Jay Cutler at the helm. Cutler, of course, will be Marshall’s starting quarterback again in Chicago. Marshall’s arrival will take the heat off Devin Hester as a no. 1 wideout and keep Earl Bennett in the slot, moves that will make everyone in the offense better. In addition, the Bears won’t be responsible for paying Marshall’s signing bonus and should only owe Marshall his base salary (a little over $9 million) in each of the next three years. If Marshall becomes too much to handle, they can cut him without incurring any cap penalty. We had a whole paragraph written here about how the Dolphins now needed to sign Reggie Wayne — even if it meant throwing him a few extra bucks — because it would fill their biggest need while giving Peyton Manning extra ammunition to choose Miami over Denver in his quest for a new organization. After being linked with Manning for the past week as a combo deal, Wayne stunningly returned to the one place Manning isn’t heading to, Indianapolis. The Colts gave him a three-year deal worth $17.5 million with $7.5 million guaranteed. 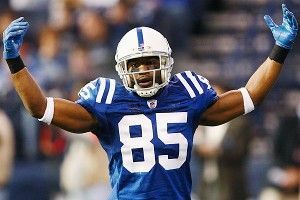 It’s shocking that the a receiver-needy team like the Dolphins wouldn’t have offered Wayne more in guaranteed money, but perhaps the veteran wanted to finish his career in Indianapolis after all. The Colts don’t exactly need a 33-year-old wideout these days, but at that price, Wayne can be a viable target for the beginning of Andrew Luck’s career without costing the organization very much. It’s a win-win-oh-my-god-the-Dolphins-lose deal. And as for Jackson, he finally got the long-term deal he’s sought for years by inking a five-year, $55,555,555 contract with the Buccaneers to serve as Josh Freeman’s top wideout. The deal guarantees Jackson $26 million. To put that in context, consider that Jackson has more receiving yards over the past three years than Garcon despite being thrown 97 fewer passes (344 for Garcon, 247 for Jackson), while his catch rate is at a far-superior 58 percent despite being the target of so many Philip Rivers prayers downfield. We’ll stop picking on Garcon now. Jackson has his own history of off-field issues and has spent his entire career playing in an effective passing offense with a great quarterback, so he could qualify as a free agent from hell (especially if you consider Antonio Gates to be the team’s top target), but his sheer size and athleticism should play well in a division with small corners like Brent Grimes and Jabari Greer. The Bucs should be a little concerned that they have two wideouts of markedly similar styles in Jackson and Mike Williams, though, and they might want to stay in the market to add a slot receiver who can do some damage underneath. That player could be Early Doucet, who the Cardinals can’t afford to retain. The Chargers found their replacement for Jackson in Robert Meachem, giving the former Saints wideout a four-year deal with $14 million in guaranteed money after he failed to come to terms with the Bills. As a third or fourth option in the Saints’ passing attack over the past few years, Meachem’s been remarkably consistent. Over the past three seasons, he’s started either seven or eight games, caught between 40 and 45 passes, and averaged between 14.5 and 16.0 yards per catch. Those numbers have some value, but at 28, it’s worth wondering whether Meachem is ever going to become anything more than that. If the Chargers continue to use Meachem as a third target, they should find that he’s up to the task. If they expect Meachem to be their no. 1 receiver, though, San Diego might be disappointed by what they find. Last August, Cortland Finnegan disappeared from Titans training camp and attributed the absence to a personal matter. The personal matter was that he wasn’t happy with his contract and wanted the Titans to give him a new one. As you might suspect, the Titans were not desperate to re-sign Finnegan this offseason and let him go to St. Louis, which released a bevy of veterans to sign Finnegan to a five-year, $50 million deal with $26.5 million in guaranteed money. Much like the Redskins, the Rams desperately needed help at cornerback. Their top three corners all went down with season-ending injuries last year, and since previous ace Ron Bartell’s injury was a fractured neck, it’s easy to understand why the Rams would go out and target a top corner. Is Finnegan a top cornerback, though? Pro Bowl voting is far from exact, but Finnegan’s only made one Pro Bowl in his career, and that was in 2008. More importantly, is Finnegan going to be a Pro Bowler with the Rams? St. Louis is paying him like one, and there are reasons to be concerned about his future viability. Finnegan, who just turned 28 in February, is generously listed at 5-foot-9. The recent history of short cornerbacks making it into their thirties as starters is not very long, as only five players listed at 5-foot-9 or less have started 12 or more games in a season after they turned 31 since 2002. That includes a few embarrassingly bad seasons, too, for guys like Fred Thomas, Dre’ Bly, and Tyrone Poole. The only short corner to really keep up his performance at a high level into his early thirties is Antoine Winfield, while dozens of taller corners have lasted into and beyond that age range over the same time frame. The Rams might get a year or two of solid performance out of Finnegan, but this contract is likely to end very messily. Compare the Finnegan signing to that of Carlos Rogers, who re-signed with the Niners on Tuesday on a four-year deal for about $30 million. There’s no word yet on the guaranteed money, but Giants cornerback Terrell Thomas re-signed with his team on a similar deal with about $11 million guaranteed, and it’s hard to imagine that Rogers would get more than $15 million or so of his deal locked up in guaranteed cash. Rogers was better than Finnegan last year, when he made his first Pro Bowl, and he’s arguably been better over the whole of the past three years. And for that, Rogers is getting about as much total money over the length of his contract as Finnegan’s getting in guaranteed cash. That’s a victory for the San Francisco front office, which now returns all 11 starters from last year’s dominant unit. Don’t let him leave the facility. It’s the rule that every team follows when a big-time free agent heads to their city for a visit. If you get a player to hop on your private plane and head to your town for hours of meetings and interviews, your best way to sign that player is to lock him in your offices until he puts pen to paper. If that means ordering in the fanciest dinner in town, turning on the stadium’s lights, and dining on the 50-yard line, you do it. If it means adding a few million dollars to the contract figure you had in mind, you do it. If it literally means locking the doors and stalling the player in question from getting in a limo to take him back to the airport, you do it. The moment that player leaves your facility and heads out of town, though, your odds of signing him decrease dramatically. The Bills had their shot at Mario Williams last night. They weren’t able to keep him in the facility. Although we suggested that the Bills should only enter the market to make a Godfather offer to Williams, we were pleasantly surprised to see that they actually went ahead and convinced Williams to start his free agent tour in Buffalo. They presumably got Williams to head there by telling his agent that the organization would give Williams the prescribed $40 million in guaranteed money that would help make him the highest-paid defensive player in NFL history. It’s here where the NFL’s business model shines through. Because the league’s television contract is entirely national and split evenly between the league’s 32 teams, every team has enough money to make a legitimate top-dollar offer to the best free agent on the marketplace. Meanwhile, baseball teams who were already struggling with an income gap between the haves and have-nots are facing cavernous differences in their local television deals. The Pirates would not have been able to credibly offer Albert Pujols $300 million this offseason. The Bills — in a tiny market with a 40-year-old stadium — can outbid the rest of the league for an elite player if they want to. Unfortunately for the Bills, it takes two to tango, and it doesn’t appear that Williams wants to dance. In all likelihood, Williams chose to start his national tour in Buffalo to send a message to his other suitors. Baseball’s rumor mill is famous for introducing the Mystery Team, an unknown suitor who agents would perpetually report as lurking in the shadows to sign their free agent for an exorbitant sum. Williams has basically started free agency by going to visit the Mystery Team. He can now go visit any other team in the league and tell them that Buffalo’s made him the biggest offer any defensive free agent has ever seen, and unless they’re willing to come close to that offer, he’ll go back to Buffalo and take their money. The Bills don’t have the leverage to take their deal off the table, since there’s nobody else in the market who would be worth that sort of contract. Even if Williams has no intention of ever signing with the Bills, it makes total sense for him to start his search there and strike fear into the penurious hearts of owners around the league. Of course, Williams could still end up sticking around in Buffalo and signing with the Bills. Maybe they sweeten the pot and make it $45 million, or Williams simply changes his mind after a long night’s sleep and decides to stay. Nobody even whispered Williams’s name in reference to the Bills before free agency began, so there’s little reason to trust the rumor mill surrounding him now. We know one thing for sure, though: You can’t sign a contract with one team when you’re locked inside another team’s facility. Once the Bills got Mario Williams inside of Ralph Wilson Stadium, he shouldn’t have left without a contract.